Advanced outdoor trousers for warm climates and high activity levels. The Men's Gaiter Trousers No. 2 have the same innovative gaiter feature as Fjällräven's Gaiter Trousers No. 1 but using a lighter fabric with excellent ventilation. They are lightweight, packable trousers that are hardwearing enough to suit long adventures in difficult terrain. The gaiter feature means you can adapt the trousers to the conditions you find yourself in. When the temperature rises, the lower legs can be zipped off to give you a pair of shorts. The knee sections of the legs can be folded into the gaiters and drawcords at the back of the knees can be used to adjust the width at the top, while boothooks can be fastened to boot laces to keep the gaiters in place. In addition to the boothooks there are drawcord adjustments and eyelets to attach straps or stirrups to go under boots for extra security. Zips along the thighs give extra ventilation. There are two spacious leg pockets with flaps plus hand pockets and back pockets with buttoned flaps. The Men's Gaiter Trousers No. 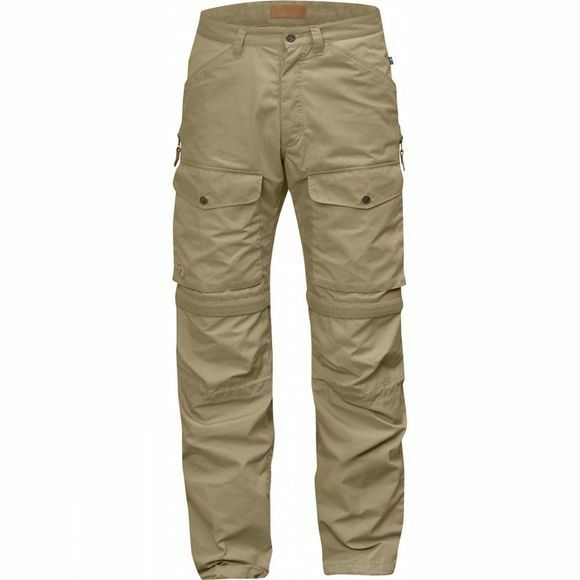 2 are made from durable, wind and water resistant G-1000 Lite Eco (recycled polyester and organic cotton) with G-1000 Eco over the rear, pockets, knees and on the gaiters. The fabric can be waxed with Greenland Wax for enhanced weather protection, or the wax can be washed out to give a cooler garment with maximum ventilation. The fabric and details have been chosen to minimise their impact on the environment – for example most of the leather details are made from leftover pieces of leather – and to make it easy to replace exposed sections after years of use.